Bob Hawke probably understood the nature of the Australian soul better than anybody. In 1987 he threw his full weight behind a ‘Welcome Home Parade’ for Vietnam Veterans and took the salute as 25,000 diggers marched past Town Hall in Sydney. He instructed the RAAF to fly as many as they could from as far afield as Western Australia to enable them to participate as part of the healing process from the aftermath of the war. Three years later his Labor Minister for Veterans Affairs, Ben Humphreys, reminded him of the approaching 75th anniversary of Gallipoli. Hawkie didn’t hesitate to make sure it was properly commemorated. ‘Because of their devotion to duty and their comradeship, because of their ingenuity, their good humour and their endurance, because these hills rang with their voices and ran with their blood, this place Gallipoli is, in one sense, a part of Australia’. ‘Gallipoli and the history of the Australian nation are indissoluble. It is inscribed in legend. ‘We will continue to hold the memory of those who served and died as inextinguishable and sacred. ‘We will continue to remind ourselves – “Lest We Forget”. ‘Legends bind nations together. They define us to ourselves. ‘The spirit of Anzac became the canon of Australian life: the ideals to which we aspired, the values by which we lived. ‘The Australians who served here in Papua New Guinea fought and died, not in the defence of the old world, but the new world. Their world. ‘They died in defence of Australia and the civilisation and values which had grown up there. 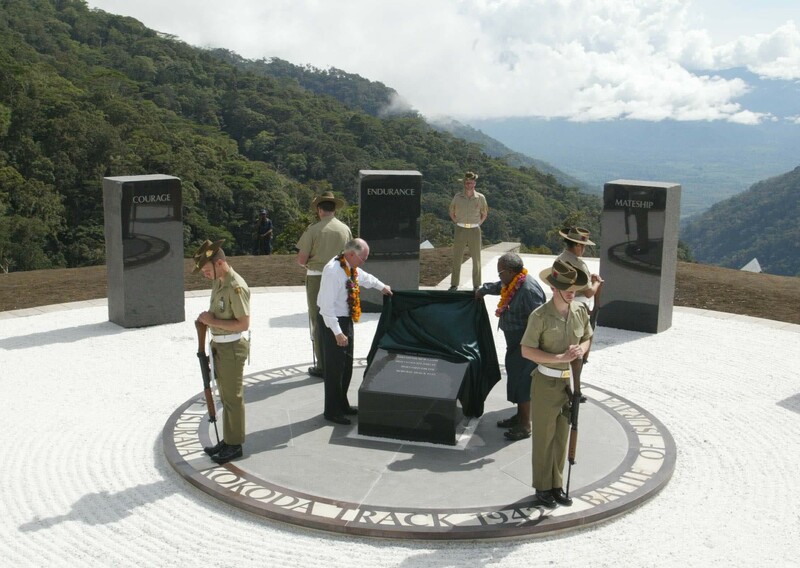 Little did Keating realise that within a short span of 25 years not one of our elected leaders would attend the 75th anniversary of the Kokoda campaign at the Bomana War Cemetery and not a single veteran would be invited! The Minister for Veterans Affairs, Dan Tehan, did not attend a significant commemorative service at either Bomana War Cemetery or Isurava during his two year tenure as Minister for Veterans Affairs in 2016-2017 – and he just got promoted! How does that work? The only Liberal Prime Minister – or Minister – to show a genuine interest in our wartime heritage in PNG since the war in 1942 was John Howard. After I confirmed the location of the Isurava battlesite in 1996 a contingent of veterans from the battle expressed an interest in visiting it for a ‘last parade’ on the 26th August 1998. We relayed the request to Prime Minister Howard via Senator Bill Heffernan and he made his Boeing 707 available to fly them to Port Moresby without hesitation – just as Bob Hawke did for our Gallipoli veterans in 1990. He also positioned a couple of RAAF caribou aircraft at Popondetta with medical teams in case any of the veterans needed assistance. “We have come here today as pilgrims to be reunited once again in spirit with our fallen comrades of 56 years ago. That is the essential ingredient of a pilgrimage. The journey into a sacred place has an act of spiritual devotion. For the true, the noble and the brave do die in body but their spirit dwells forever more in the habitations and the men they served and loved. Four years later Prime Minister John Howard commissioned a magnificent memorial to be erected at the battlesite for the 60th Anniversary of the battle. He officially opened it with his PNG counterpart, Prime Minister and Grand Chief, Sir Michael Somare on the 26th August 2002. Since then the memorial has taken on a spiritual significance for the thousands of Australians who visit the site each year. Prime Minister Julie Gillard didn’t get commemoration. 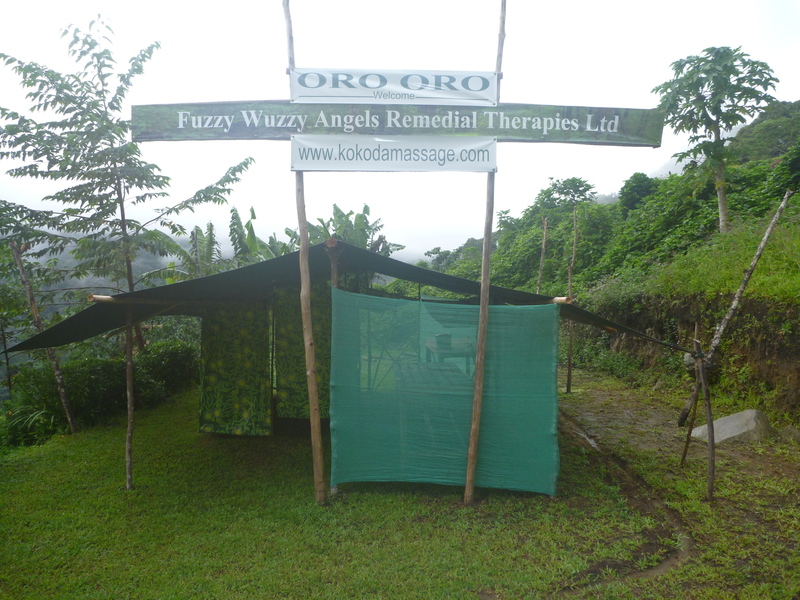 During her watch her bureaucrats from the Department of Environment build a massage parlour on the same site during the 70th anniversary of the Kokoda campaign. It was removed after strong protests about its appropriateness as a commemorative structure. Those who understand the Principles of Commemoration had hoped for a change in attitude towards the protection of our wartime heritage in PNG with the election of a Coalition Government. Unfortunately nothing changed – new Ministers were duly appointed but the same bureaucrats remained in control and the same lackadaisical attitude towards commemoration Papua New Guinea prevailed. As a result, the 75th anniversary of the most important campaign fought on our doorstep during our darkest hour passed without notice. 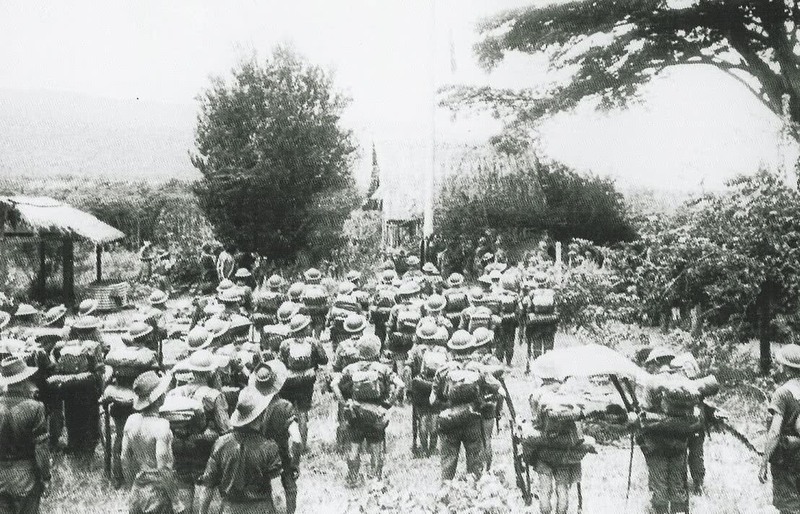 On 3rd November a couple of thousand men from two Brigades stood before General ‘Bloody’ George Vasey as the Australian flag was raised on the Kokoda plateau after the area had been re-occupied by our troops the day before. 75 years later hardly anybody turned up! Hawkie would never have allowed that to happen. Is it any wonder that he and John Howard are regarded as the two greatest Prime Ministers Australia has had since the Menzies era? They had a shared understanding of commemoration and the nature of the Australian soul. Their commitment to commemoration reflected the motto of the heroic 2/14th Battalion: ‘Deeds not Words‘. We live in hope that somewhere, somehow, some-day we will be blessed with a Veterans Affairs Minister who understands commemoration and the meaning of ‘Lest We Forget’.